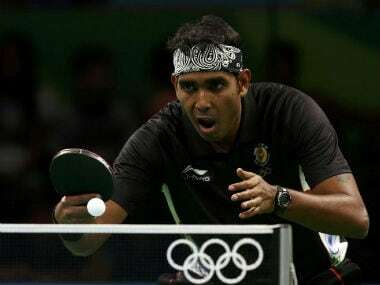 There were days when Sharath Kamal wanted to just quit table tennis. He just couldn't take it anymore. The injury he suffered at the 2015 World Championships in China seemed to have sucked the life out of even a veteran like him. It nearly ended his career. It was tough, so tough that you could still sense the pain in his voice when he talks about it as we sit down for an interview at the Khar Gymkhana. Back in 2015, Sharath was riding the crest of a massive wave. He was toppling some of the best players in the world and had leapt to a career-high ranking of 32 in the world. He had worked hard for it for four years since hitting a slump in 2011. Then, fate decided to be cruel and he suffered a hip injury in the second round of the World Championships. FP: You had suffered a hip and hamstring injury during the World Table Tennis Championships in Suzhou, China, in May last year. You were looking in good touch before that. How much of a setback was that? Sharath: It was a very big setback. Because I was hitting my peak at that time. That was the work of four years. In the four years (before that), I was working very hard for that (World Championships). In 2011, I had hit a slump. From there I started working and when I was hitting the peak, exactly at that time, I got injured. The injury was close to finishing my career. It took me a lot of time and energy to come back. And there were doubts – what will I do, for how long? Probably play in the Rio Olympics and may be quit. Also, I needed to qualify for the Olympics. So there was a lot of negative thoughts going on and just some positive ones. But luckily, thanks to my German club and my physio and trainer in Chennai, everything fell into place. Since the German club had a physio and a doctor, they were taking care of me there. When I came back to India, I could work much more on the physical part. And that is the reason why I am much fitter now. Even if you had seen me one year ago, I was not even close to as fit as I am now. I was quite heavy, slow. But now I am much faster and fitter. So I think the journey has been pretty hard, but I am happy that I am able to play again. FP: Personally, how did you motivate yourself? Sharath: I don't know. I really don't know. There were many days where I just wanted to quit. I really don't know how I did that (kept myself motivated). My family was quite a big support. My wife was very supportive. The initial six-seven months were really, really hard. Many times I was alone in Europe because my daughter had school in India so my family couldn't travel. They were very difficult times. At that point of time, Rio Olympics was the goal. That was the goal from 2011-12 when I missed out on London (Olympics). My family did a lot of sacrifices for me, my wife said, "I will go back home to India so that you can practise here and so that you don't need to worry about us." I was living away from my family, they were living away from me. So all that went for a waste when I got injured. That took a lot of toll on me. FP: So mentally, how much of a difference does it make that you have recovered from such a bad injury? Sharath: It makes a big difference. During the process, it puts you so much down that you can't even perform your average; you go below average. So it's very hard to get back from that and now when I know I have come from being down, confidence is really difficult (to get). That's probably the reason I won the National Championships after five years. FP: What new things have you added to our armory apart from the backhand? Sharath: The physical fitness part. FP: You played against a 13-year-old in the semi-final of the Indian Open. Did his age bother you, or did you treat him just like a regular opponent? Sharath: I think only for the press and media, his age is a big number. For us players, it doesn't matter. We are also playing 40-year-olds. It doesn't matter. The second seed in the Indian Open was a 40-year-old. Nobody asked about that. At 40 years, he has played the semi-final of the Olympics. But I don't know why people have this thing of 13 years, 10 years, five years, 34 years. Age is just a number. If I am able to win at my age, I am 34... that doesn't mean older is better and younger is weaker. It's just that he (the 13-year-old opponent) is a good player. His world ranking was 69, and I was 62. So the difference was not much. Just that he is a talented kid and has been playing well. FP: So, age doesn't matter in table tennis? Sharath: Yes (nods), in any sport, in any field. We do respect that at 13-years of age, he is able to compete against us. Yes, of course, we respect that, but at the same time, he is on the other side of the table to beat me. See, I am not playing a hobby tournament or in the society with a younger player. There is nothing of that sort. We are at war and the best player will win. FP: At the Indian Open, you beat world No 24 Yuto Muramatsu, who is a defensive player. What did you do different? Sharath: Nothing, I am good against defence. It's not that I am bad. But probably I would not have converted as many matches as I have lost to the defensive players. But normally, I am good against them that's because my father, my coach, Srinivas Rao was a defensive player and ever since I was young, I practised with him, which helped me a lot. And against most of the defensive players, my forehand is the most important weapon. And that day (against Muramatsu) it was working really good. So I could finish the match 4-0. FP: How much of a physically demanding game is table tennis? 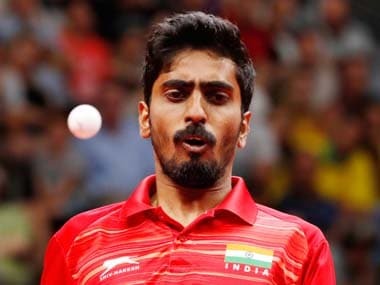 Sharath: If you compare it to tennis, badminton and squash, you cannot compare it physically because of course the area is bigger, the margin of errors is quite big and even if you mistime a shot, you can still go on and continue playing the ball. But in table tennis, the margin of error is very minimal. Because the table is small, there is a lot of spin and it's too fast. So I think physically, we don't need long endurance, but we need to be very fast in the shorter duration. For example, we need to have a lot of explosive bursts for five to ten seconds continually. Five to ten seconds and then a break, five to ten seconds and then a break. That is the most important thing. FP: How has your training regime changed over the years? Sharath: In the last six months only, it has been more physical (training) and less of table tennis. That's the only change. Otherwise it's been the same. FP: The Indian table tennis coach Massimo Constantini has said that India are good in skills but not with mindset and fitness. What do you think needs to be done? Sharath: We are good in terms of mindset also. It's only fitness (that we have to work on). Skill and mindset are there, otherwise you cannot produce so many players who are playing good at the international level, especially in the junior stage. In the junior category, we are quite good. Even at international level. That is only because we are mentally stronger. Born in India, you have to be a survivor. You need to fight for the simplest of things. For the simplest of things you need to stand in the line, you need to fight, you need to wait. So that makes you mentally stronger than the kids in the developed nations where life is easier for them. But, of course, they get better later in their life because they know how systematic training helps them and how technically they can work. That is a thing which we lack. But I think in skill and mentality we are quite ahead. Physical (fitness) is the part which needs work because I am the only one who is tall, while others are a little shorter and a bit thinner, (with) no muscles, (and are) not able to be as fast as possible. I think that is where we need to work a lot. FP: Why are the Chinese so dominant at this sport? Sharath: The first thing is, traditionally, they have been one of the best in this sport. They have the knowledge and technical know how. And at the same time, they spend a lot of time in training which most of us cannot afford because you could get injured. They do that because they have a large base of players. So even if 10 are injured, there would still be one player who is playing good. So it is little bit like cricket. Why is India good in cricket? It's only because the number of people playing cricket in India is bigger, so the talent hunt is easier and out of this, people who convert are better. But in most other sports, there are only few talents and they have to be nurtured. FP: What does India need to do to spread awareness on the sport? Sharath: The mentality towards the sport (should change) and there should be awareness. But it's changing now. (It has been changing) Since the 2008 Olympics, since we started to win gold in the Games. The media has also been doing the job of promoting the sport. The attitude is slowly changing but still we are quite far away. The most important thing to develop the sport would be to develop the infrastructure. That is one thing which we lack as a big country. We don't have the infrastructure for the kids to play' mostly they are playing in parks or neighbourhood colonies. They don't have proper places to play. If that develops, the sport by itself will automatically improve. FP: Was that one of the reasons you moved to Germany? Sharath: Yes, the most important reason why I moved to Germany was that I could play the club matches. (I wanted to) Play for a club so that I can train there throughout the year, 10 months a year and at the same time, have good practice partners regularly. And I can play with different players. Here I am playing the same players for the last 10-15 years. So I know everybody and they know me. There you play so many different players; every weekend there is a match, you play different players that gives you a lot of experience (and) at the same time, you get a lot of variations with which you can be a complete player. That was one of the primary reasons why I moved – for better matches and better practice. The infrastructure is better there, the practice conditions, everything is a little better there. FP: Was it financially feasible for you to move there or you faced problems? Sharath: In the first year, yes, I did face problems. But I was lucky that I could start performing well at international level quite early in my career. So then I did not have to invest so much because the clubs and the other players knew me already – that I came from India and I had good talent. There was a good chance for me. The clubs were also willing to take me in. It's not that I had to spend all my money. In the first year, yes, I did have to spend money to make my mark in the international arena. But soon after (that), I could fund myself with whatever I was earning there. I could spend on my training and equipment. FP: Were you working along with playing there? Sharath: No, (when) you play for the clubs, they pay you salary. FP: How has life changed after the birth of your daughter? Sharath: Very much. Before I could just travel, like I planned tomorrow and I could travel the day after. But now the plan needs to be six months in advance and my wife needs to know where I am, my child needs to know what I am doing. And then I need to work according to the plan. It's all about planning. Before you could be how you want, nobody was dependent on you, but now people are dependent on you and I am also dependent on them. FP: Is the IPL-style league in table tennis actually happening? If yes, how will it change the Indian table tennis scenario, and how will it benefit the Indian players? Would it be able to generate awareness about the sport? Sharath: Yes, it will start in July and happen for three weeks. They are trying to get in most of the top players in the world. It will develop the game quite a bit. You already saw the Indian Open getting a huge response because it was very well organised. They spent a lot of money on a lot of aspects which promoted the sport. It will bring in a lot of promotional stuff. And at the same time, there will be a lot foreign players and some coaches too with whom (Indian) players and coaches can interact and the knowledge can be shared. That will in turn help the sport. FP: Were you surprised by the response the Indian Open got? Sharath: Actually not. In 2015, I played the Asia Cup in Jaipur. I did very well there also. There it was more because of people's interest and social media was helping to promote it. During the Indian Open, because television was there, the promotions from the organisational side were very good. It took a larger perspective. If it didn't go to this level, I would have been disappointed. FP: You play for Borussia Dusseldorf, which is one of the best clubs in the league in Germany. What does India need to adopt from there? Sharath: Well, this question will take me a few days to answer (laughs). There is a lot to learn from Europe. Infrastructure would be the biggest thing you could adopt (and also) how the players use the infrastructure, how the administrators plan, how much of planning goes into the process and how the players become so good out of the system. FP: What do you exactly refer to by infrastructure? In football and cricket you have huge grounds, nets and so on. In table tennis, what sort of infrastructure are you looking at? Sharath: You need a decent hall with eight to ten tables. You need gym, physios and support staff. More or less, that is all. Many times you are playing in a small hall where there is not much place and the floor is slippery. When you play in those kind of places, your thinking is also small. When you play in a bigger place, you think big. FP: How important a role does equipment play in table tennis? Sharath: It is very important. Very, very important. Not only in table tennis, but in all the sports, good equipment give you an edge over most of your opponents. FP: Can you take me into some technicalities of it? Sharath: There are too many technicalities. This is also the reason why table tennis is a difficult sport. There are too many rubbers, too many blades and too many balls. The difference between each of them could be marginal. But then with our sport, which is so fast, even the smallest of margins makes a big difference. So I think equipment is very, very important. It takes time for you to know exactly what you need. Even now, for me to change into something, it takes me a lot of time, but yes, many times you need to make the change. FP: You think there is a need to standardise? Sharath: That is not my forte so I don't care about that. FP: Can you tell us what blade and rubbers you use and whether you experiment with using different blades and rubbers? Sharath: I am sponsored by a company called Joola. I play with their blades and rubbers. I have been playing with them for the past six years and I am happy with their equipment. FP: Overall, is it possible to earn a decent living from the game? Sharath: See it depends on what you are looking at. Most of the table tennis players are employed by PSUs or government institutions and the way sport is encouraged in our country is through sports quota jobs. If you play at the state level, you get a clerical job and at the national level you get an officer's job. It depends on what you are looking for. If you compare it to IIMs or ISB or IITs, then of course, there is no comparison. But if you are comparing with an engineering college or an MBA graduate, then the living is pretty decent. But when you go on to the academic side, everybody gets a guarantee. If you study this, you get this much of salary, (which is) more or less guaranteed. In sports, there is no guarantee. So that is a small setback in sports. There is no guarantee that you will be good and you will be paid so much and there is no slab. That is the reason most of the parents are a little sceptical about sports. But on the other side, yes, if you perform for the country, then of course, there is a pretty decent living. 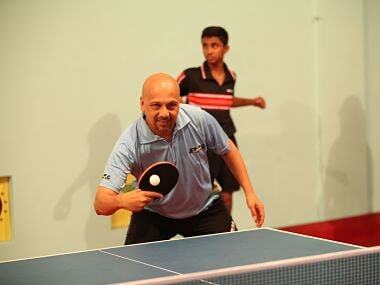 FP: What should be the aim of an upcoming youngster in table tennis? Sharath: The aim must be to win medals for the country. It shouldn't be that I want to play for school or college or state. Always aim big and work on it. FP: Have you started preparing for the World Championships? Sharath: I have started preparing for the 2018 Commonwealth Games and 2020 Tokyo Olympics. The World Championships is right now. The process is already on. FP: What's your next aim now? Sharath: I need to break into the top 30. I hope to do it by the end of this year. Because when I was 32 in the world, I got injured. That is what I have been looking forward to for a very long time. And at the same time, I would like to win back the Commonwealth Games gold in 2018. And then (you have) the 2020 Tokyo (Olympics). Let's see how it goes. FP: After you say good bye to the game will you be interested in giving back to the game? Sharath: At the moment, I am still playing. I really haven't thought (of it). Of course, many people are saying you need to start thinking now. But then by starting to think now, I will be putting an end to my career. I want to take one thing at a time. But at the same time, I will be associated with the game because there is a lot which I have gained from the game and that needs to go back into the system. It should not be finished with me. For example, what I have learnt in Europe, the knowledge I have and the database have to go down to the players. It should not die with me. The upcoming coaches and players need to learn from me. So I will be associated with table tennis, but in what way, I don't know. 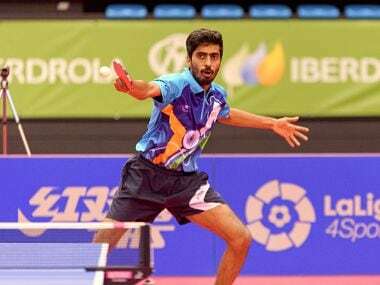 FP: How long for Sharath Kamal? Sharath: I want to take it year by year. Now it's 2017, and I want to see how it goes because I have a family, I need to take care of them and they need my support also. I have a six-year-old daughter and she is not so happy that I am travelling so often. So all that takes a lot of energy and toll on my career mentally. Therefore I want to take it year by year. If I go on like this for the next 10 years, well and fine.